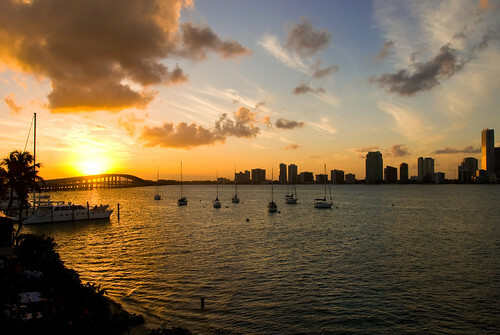 Here is a gorgeous photograph of downtown St. Pete just after sunset. I love the contrast between the jewel-like effect of the lights along the causeway and the high-rise buildings against that very soft pinkish-violet and the clear blue of the sky. The red and yellow boat (where is it heading??) adds as a touch of warm color to the icy diamond-like lighting effects along the causeway. I do not own the rights to this photograph, but am using it in compliance with a restricted Creative Commons license. Please do not save or use it without first checking the terms of the license here. There's something so surprising to me about Tampa's silver and platinum urban castles set right next to the water. I've never seen Tampa from this angle, which really brings out the beautiful harmony of seaside color that the city's planners have managed to capture. But what really sold this photograph for me was the traces of pure royal blue dotted here and there along the waterfront and that one little splotch of red on that round, platinum-tinted tower (one of my favorite Tampa buildings, photographically) on the far left. Gorgeous. I do not own the rights to this photograph, but am using it in compliance with a restricted Creative Commons license. Before saving or using it, consult the terms of the applicable license (shown here). To be honest, I have grown tired of looking at sun-over-water photographs. There are so many of them and they are all so similar. I have already found some of Flickr's best, but how many photographs of rolling waves or serene Gulf with the sun behind them does one site need? But then I saw this, illustrating how in Florida nature regularly transforms even the most workaday commercial landscape. I love the watery effect of the sun behind the mist and the even waterier (well, naturally) effect of the reflection. I love the pastel tints infusing the urban landscape. Look how you can see the city's towers in the distance. What you have to remember about Florida is that everything single thing here is beautiful at the right time of day. You just have to find that right time. Is that true everywhere else? Maybe. It's only since moving here that I've noticed it. Don Jones is another of the Florida photographers whose work mirrors some of my own preoccupations, e.g., a love for old abandoned buildings and Florida's weird and entrancing blend of the old and nearly forgotten with not only the new but also the strange and futuristic. 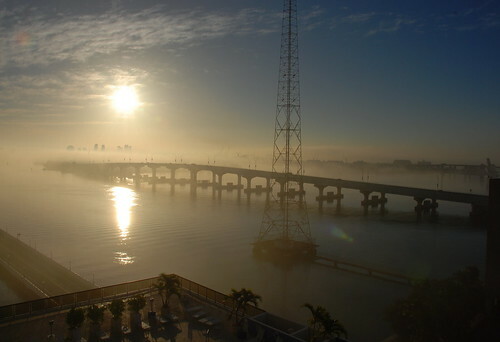 This collection of Florida imagery needs that blend. It's what Florida really IS. Here's Orlando---the ultimate generic city if you don't know where to look---looking anything but. 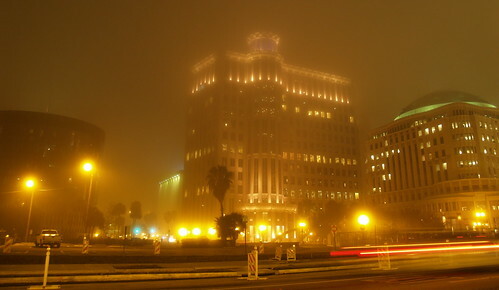 "Downtown Orlando at 4:30AM on a foggy night," said the photographer. That's right: 4:30 am. Another thing about photographers who create art that mirrors life is that they know you have to be there at the right moment and that the right moment chooses itself. "Taken from Parrot Jungle Island in Miami Florida," the photographer explains. To really get the full impact of this stunning panoramic photo, please click here to see the larger version. I do not own the rights to this photograph, but am using it BY PERMISSION of the owner. Please do not save or use it without first obtaining the owner's permission. 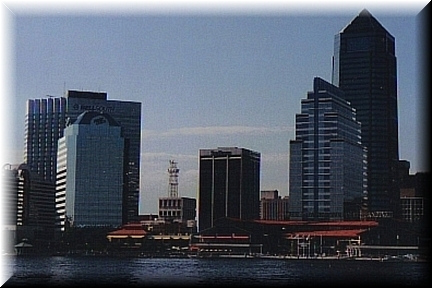 Jacksonville, which at certain times appears to be all faceless glass towers and steel boxes like any other city, can make itself part of the hidden Florida that you always have to be on the watch for here. It's a question of timing and perspective. There's something recondite about massive towers along a river, I think. A person from another age would be stricken dumb by the sight of these glass and steel castles glittering in the sun. People shouldn't let themselves get too used to things. Here is the world itself and here are the things we build on it, but the water of the St. Johns (which flows south to north) isn't tame for all that; and the huge steel bridges can look very menacing against the dying light. I am always trying to see familiar places in a fresh light; it helps to remind me that the world is beautiful and mysterious everywhere.